At Rayavadee, there is a choice of pavilions and villas to choose from: 77 Deluxe Pavilions, 8 Spa Pavilions, 9 Hydro Pool Pavilions (1 bedroom), 2 Family Pavilions (2 bedrooms), 2 Family Pavilions with Hydro Pool (2 bedrooms), 1 Rai Talay Villa, 1 Rayavadee Villa, 1 Phranang Villa. 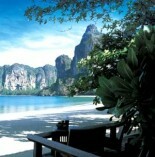 Rayavadee is located in the Krabi province in Thailand on the Andaman Coast (800 kms south of Bangkok). Phuket Airlines and Thai Airways both operate flights from Bangkok to Krabi. There are also other flights into Krabi from neighbouring provinces. 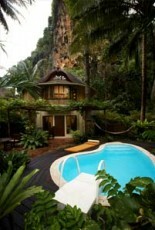 Rayavadee is a luxury resort located in the province of Krabi in Thailand. Nestled between two beautiful beaches, Nam Mao and Railay, are a variety of luxury pavilion rooms and villas to choose from offering spacious accommodation and magnificent views. Krabi Province is located on the Andaman Coast just south of Bangkok. There are pristine white sand beaches, magnificent islands and beautiful crystal blue water all surrounding this luxury haven of Rayavadee. At Rayavadee there are 98 pavilions to choose from and 3 unique villas all offering individual styles and amenities. Some even have their own private pool or Spa Pool and terraces. Please refer to side menu for more detailed information on the different luxurious accommodations on offer. There are four stunning restaurants and bars to choose from when dining out including Raya Dining, Krua Phranang, Rai Talay Terrace and the Grotto. Or alternatively, dine under the stars on your own terrace with a romantic meal or barbeque. Rayavadee Spa is also on offer to all of the guests enhancing their stay at the resort. Their experienced spa therapists are dedicated and provide only the best world-class treatments such as facial treatments, body wraps, body scrubs and massages. Come and stay and experience Rayavadee, located in one of the most beautiful and scenic parts of Thailand! The quoted rates do not include a 10% service charge or any applicable local government taxes. Krabi is located on the Andaman Coast making it an ideal spot to be based in order to experience the on-water and inter-island activities available in the region. From Rayavadee you can cruise to the famous James bond Island or Phi Phi Island. Other near by activities include rock climbing, white water rafting, scuba diving, snorkelling, river kayaking, elephant safaris, and rainforest treks. In Rayavadee resort there is a tennis court, squash court, magnificent pool, library, fully equipped gym, and cooking classes!